The Boston Global Forum (BGF) collaborates with UNESCO on global education and citizenship projects, especially through the Global Learning and Global Citizenship program at the University of California at Los Angeles (UCLA). Prof. Carlos Alberto Torres, Distinguished Professor of Social Sciences and Comparative Education and UNESCO Chair in Global Learning and Global Citizenship Education at UCLA, is a member of the BGF’s Board of Thinkers. Bringing together public- and private-sector leaders, the Dubai forum addressed ways to make education everybody’s business, reconcile relevance, excellence and inclusiveness, and promote stronger linkages for young people with the fast-changing world of work. 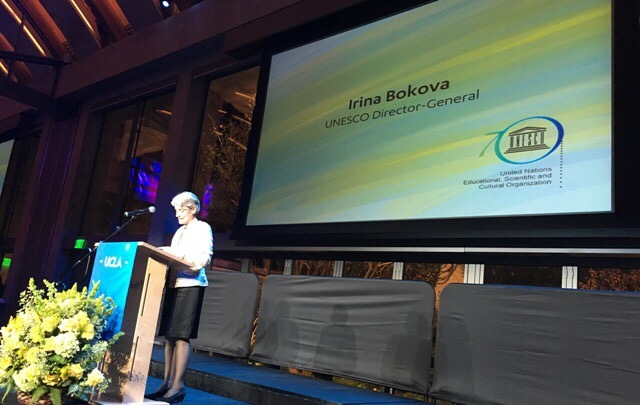 The director general shared UNESCO’s vision on what education should look like in 2030; on global citizenship; on girls’ and women’s empowerment; on addressing humanitarian crises, and on related issues in a session moderated by Economist senior editor Ann McElvoy. Ms. Bokova also interacted with 40 girls given the Sheikh Fatima Bint Mubarak award for their academic success and commitment to social responsibility. She also attended the Global Teacher Awards ceremony.